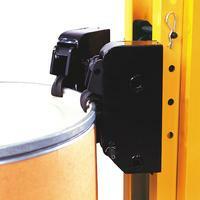 The top of the line Eagle 4 Series of lift truck attachments incorporates heavy-duty Eagle-Grip double articulating clamping mechanisms for handling any steel, plastic or fiber chimed drums in high volume applications. 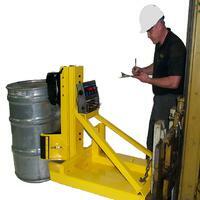 These attachments provide the safest available method of lifting and transporting any chimed drum with a lift truck. 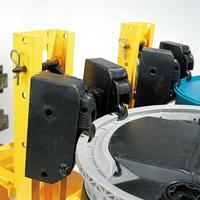 The clamping mechanisms are completely mechanical requiring no hydraulic or electrical connections. 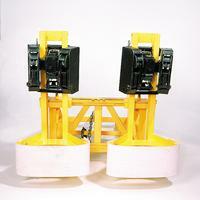 Each drum is gripped with two upper and lower jaws in heads which are spaced about 6 inches apart. 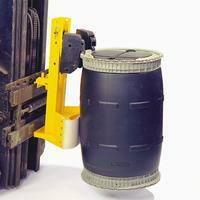 The swivel action of the Eagle 4 Series is operator friendly permitting pickup of misaligned or slightly separated drums. 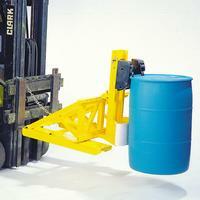 The Eagle 4 Series is strongly recommended when handling fiber and plastic drums in excess or 600 lbs. and light gauge open head steel drums.